Many of the blogs that have a huge following today go back to much more humble beginnings. This post is a look at how they got started and what they looked like in their early days, compared to today. All of the websites presented below are among the 15 most popular blogs according to Technorati. 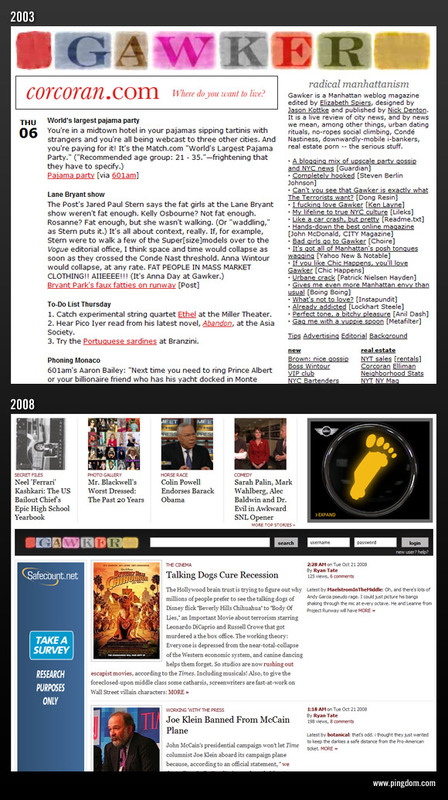 We relied on the Internet Archive to get screenshots of the old versions of these websites. 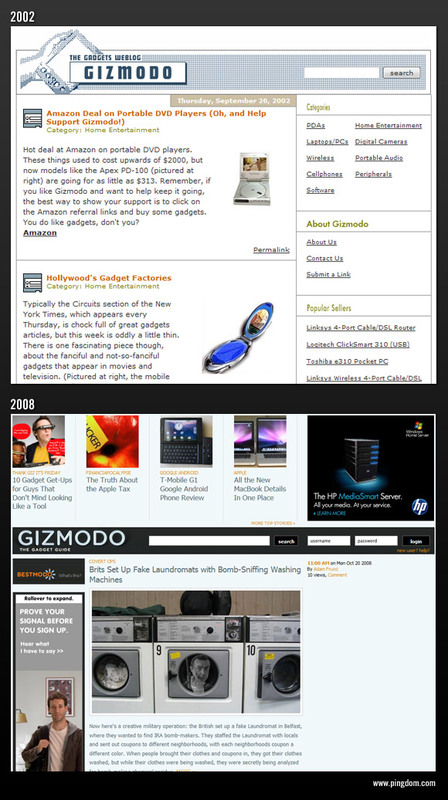 Gizmodo covers consumer electronics and gadgets. It started in 2002 and was originally edited by Peter Rojas, who was later recruited by Weblogs Inc. to launch the competing gadget blog Engadget. Gizmodo is part of the Gawker Media blog network. Technorati ranking: 2. Like Gizmodo, Engadget writes about consumer electronics and gadgets. It was co-founded by Peter Rojas, co-founder and editor of Gizmodo, in 2004. 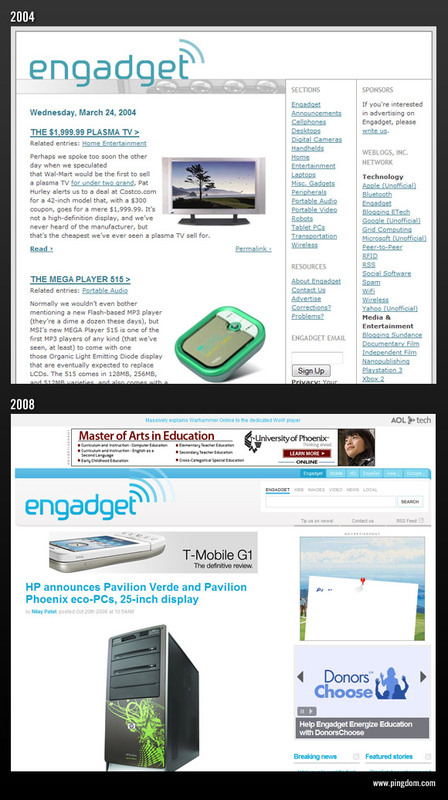 Engadget is a member of the Weblogs Inc. blog network, owned by AOL. Technorati ranking: 4. 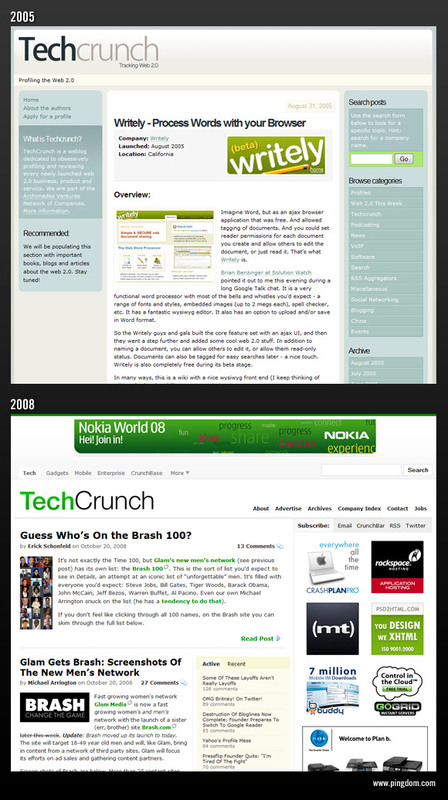 TechCrunch is a blog about Web 2.0 companies and services, covering everything from startups to trends on the Web. It was started by Michael Arrington in 2005. Technorati ranking: 3. Boing Boing covers a wide range of topics, including, technology, science fiction, gadgets and politics. Initially it was a zine started in 1988 by Mark Frauenfelder and Carla Sinclair, then in 1995 it became a website, and in 2000 it became a blog. Technorati ranking: 5. 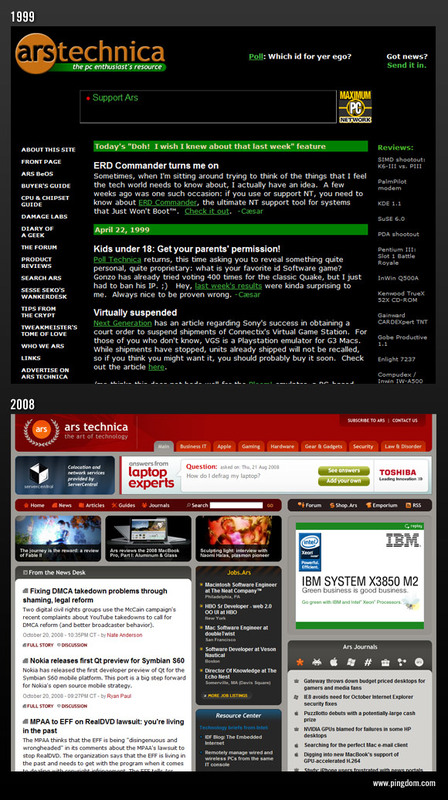 Ars Technica covers technology, science and gaming news for PC enthusiasts. It was started in 1998 by Ken Fisher. Technorati ranking: 7. 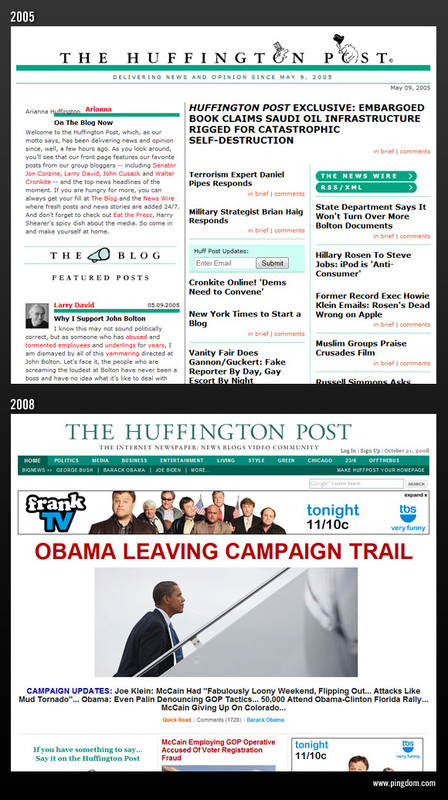 The Huffington Post is a liberal news blog covering politics, business, entertainment and several other topics. It was founded by Ariana Huffington and Kenneth Lerer in 2005. Technorati ranking: 1. Lifehacker is a blog about useful software and time-saving tips and tricks. It was founded by Gina Trapiani in 2005 and is part of the Gawker Media blog network. Technorati ranking: 6. Gawker is a media news and celebrity gossip blog founded in 2002 by Nick Denton. It is the flagship site of the Gawker Media blog network. Technorati ranking: 15. Smashing Magazine writes about subjects relevant to designers and Web developers. 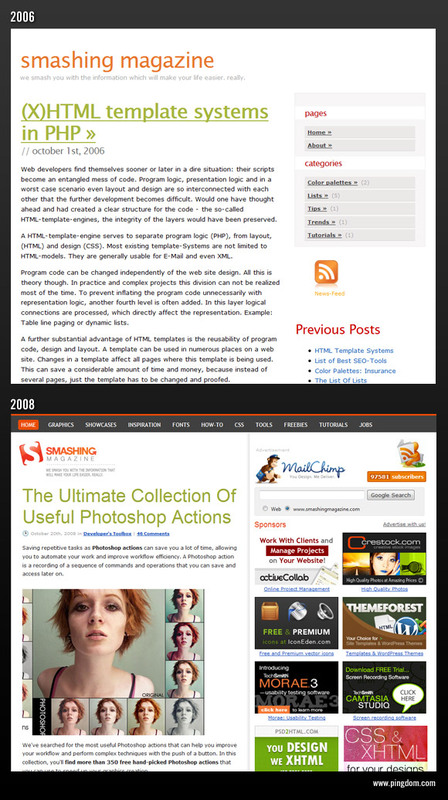 The youngest blog of this collection, Smashing Magazine was founded in 2006 by Vitaly Friedman and Sven Lennartz. Technorati ranking: 11. ReadWriteWeb writes about Web technology, applications and services. It was founded in 2003 by Richard MacManus. Technorati ranking: 13. Mashable covers social networking news and Web 2.0. It was founded in 2005 by Pete Cashmore. Technorati ranking: 14. It’s interesting to see that many of the blogs that are huge today started only about three years ago. We wonder what the blog landscape will look like another three years from now. 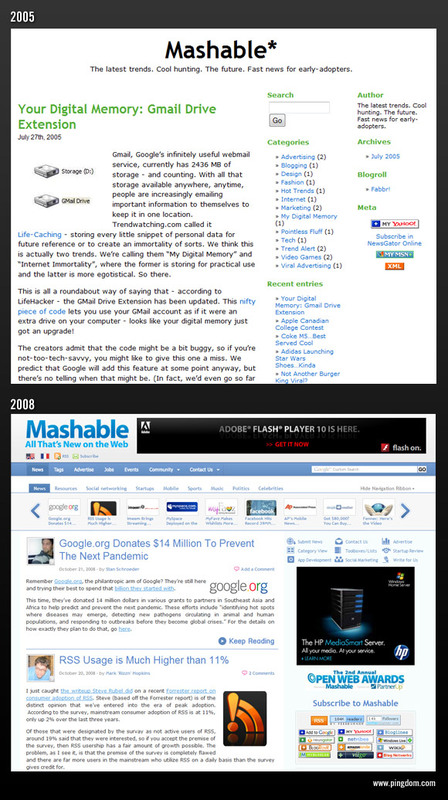 Perhaps some of the blogs just starting out today will be among the giants of 2011? Great article, I read a number of these regularly so its interesting to see how they have changed over the years. It’s kinda cool how most of them kept the same themes over the years. Branding is very important these days. This is a cool list. 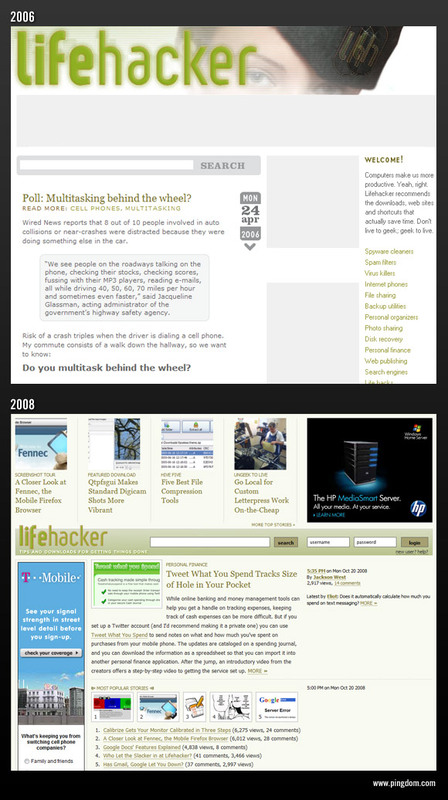 I love to see how sites evolve (I’ve been writing about a few such sites on mine) and am encouraged to see that some have made drastic changes in design over the years. Of course, if I’m one of those leaders in the future, you couldn’t find a single design that I started with. I’ve jumped through about a dozen different designs and 4 different content management systems in the last 6 months. One day I’ll end up settling, but while the excitement is still here I might as well tweak and play around with as many things as I can. I’ve been reading, commenting and a fan of several of Gawker’s blogs over the last few years and have seen the change they’ve done across the board evolve. 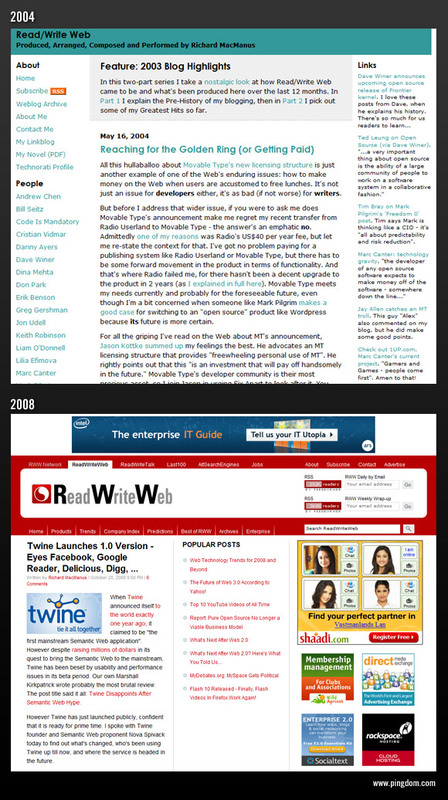 While evolution is nice, they’ve made most of their blogs unreadable in my eyes, unless you use an RSS reader of sorts. Also a fan of Smashing Magazine and was saddened when they changed to their new layout that allows more ads (fine) but reduced the width of their actual content by about 10%. Same is true with a lot of other blogs. Seems in a day and age when even the most weak computers power a monitor that runs at least 1024 pixels wide of screen resolution, bloggers and those who code themes refuse to make the content portion of blogs wider than 500 pixels. So by successful you mean the content has been successfully buried in a sea of advertising. I was just coming to post essentially what Peter did — are we really seeing design that has evolved for design’s sake? Or have the designs simply changed for the sole purpose of accommodating copious amounts of display advertising? What a coincidence, I visit every one of these sites on a regular basis. Great list, all bloggers should look to these sites for examples of the right way to do it! Funny, I like most of the original versions better. Of course, that is probably because they were advertising-less and thus had more consistent designs. On the other hand, I’m put off by themes that scream “STANDARD BLOG THEME!” I guess that’s why people are paid to be designers. Some have remarked on how much advertising there is on the modern versions of the blogs. It’s probably a hard balance for them. On one hand they need to make a living and pay their writers and on the other hand it mustn’t get too much in the way of the content. Not an easy balancing act. Amazing examples. Thanks for the article. Great article. I see that most sites switched to a right hand sidebar. Could the overall volume of sites featuring this style of sidebar begin to “blind” users in the same vein as top level image ads have in the past? Very interesting article! Intriguing the way the different blogs have developed their layout to better cram in more in less. I think it is interesting to see how widely used banners and 125×125 blocks still are. I would have thought that there would be a better solution as it has been the talk of the town for many years how badly banners convert. instead of writing about these blogs if you write on some good startup blogs then that would be really good. because all people know about all these blogs. It’s also amazing how much most of the earlier websites looked like basic wordpress themes. As they’ve improved their styles, it’s getting harder and harder to tell they use wordpress underneath (and I’m not saying that they use wordpress, but it sure does look like a lot do). Nice, one or two I haven’t come across before. It is always interesting to visit the Way Back Machine and see how the older styles look so dated. Like Taylor Dewey, I generally preferred the first versions. The designs seem to be getting too busy, real “slap in the face” type stuff that I reckon overloads viewers (especially if you are not a regular reader). I think the balance between the boring standard themes that everyday people use and innovative, original design is out of wack. The fact that there are more ads is not just a “hard balance” for the individual website owners. It speaks to a greater commoditization on the Internet, spurred both by the willingness of advertisers to see the Internet as a new medium, and the insatiable creep of capitalism. Some sites are obviously commercial in their intention (gadget sites, curated and large multi-author sites), but others have merely bought into the idea that money can be made and thus, “why not?”. 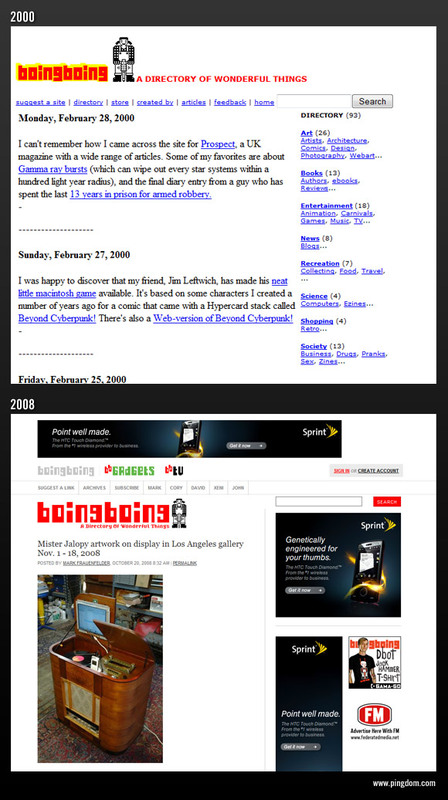 Boing Boing is the most obvious example of a site that started as fringe (doesn’t get more fringe than a zine), but is now a successful commercial entity (for no apparent reason beyond some hosting costs). The title of this blog should be “how 11 successful blogs crammed in more ads above the fold”. Nothing inspiring or intriguing here. Yawn … next! It’s great to see that so many blogs are now specializing in consumer electronics and gadgets. I’ve seen a lot of these blogs before. It’s amazing to see how a couple of these sites have just exploded (In a good way 🙂 ) over the last few years. This is one of the best posts for successful blogs I have seen. I have to agree that the images of past and present are very helpful. it’s interesting that most of the successful blogs have something to do with electronic gadgets.